Cognitec develops market-leading face recognition technology and applications for enterprise and government customers around the world. In various independent evaluation tests, our FaceVACS® software has proven to be the premier technology available on the market. Cognitec’s portfolio includes products for facial database search, video screening and analytics, and biometric photo capturing. FaceVACS-DBScan quickly compares facial images from different sources to images of faces in a database. The software can perform searches in multi-million image databases and instantly create a match list of the most similar faces. The Examiner toolset offers a powerful user interface for law enforcement customers to perform image enhancement and inspection. 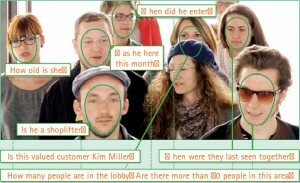 FaceVACS-VideoScan detects and extracts people’s faces in live video streams or video footage and uses anonymous facial analysis to count individuals, generate demographical information, track people movement in time and space, detect frequent visitors and crowds, and much more. 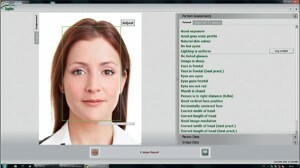 The software also applies Cognitec’s premier face recognition technology to compare faces to image databases and instantly find known individuals. FaceVACS-PortraitAcquisition streamlines and manages the production of high-quality biometric portraits, suitable for photo-ID documents and face recognition applications. The application assesses the portrait for compliance with the mandatory requirements and best practice recommendations of ISO 19794-5 standard Full Frontal image type and similar industry standards.